The pattern is inspired by the oak leaf, - Chene in French. 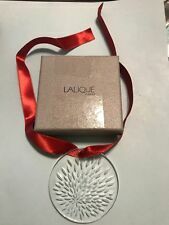 "Lalique ® France" and "Noel 2016" are etched on the side as shown. 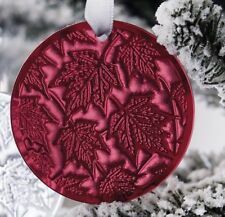 "Lalique ® France" and "Noel 2016" are etched on the side as shown. Pattern 2016. Baccarat Crystal: 2602778. Baccarat Style No:2602778. 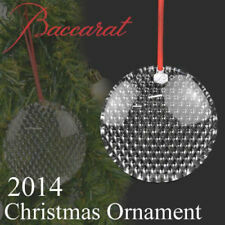 The Baccarat bauble is a traditional Christmas decoration. The Baccarat 2014 Christmas bauble reinvents previous collections' decorations. The bauble is also enhanced by the diamond cut of the crystal. Material: Precisely cut A Austrian crystals (similar grade to Swarovski crystals). It is signed Lalique, France on the side. I was not able to capture a picture of that. It also says Noel 2006. 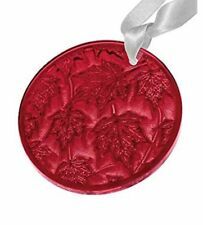 ELYSEES 2015 French Xmas Tree Pendant Mint in Box. The scintillating reflections will beautifully adorn any Christmas tree. A classic yet original gift from Lalique. STUNNING LALIQUE CAR MASCOT PERFUME 2003 LTD EDT " FALCON "
" FALCON " mascot eagle. 2003 LTD EDT adp. As mint new unopened in original box. The scintillating reflections will beautifully adorn any Christmas tree. A classic yet original gift from Lalique. Piece signed Lalique France, with box and certificate of authenticity. "LALIQUE - FRANCE". "Ambassadeur de Baccarat" is acid etched across the obverse side of the pendant. This promotional pendant was distributed by Baccarat in limited quantities to Baccarat Sales Associates. bright red Baccarat box and red Baccarat silk pouch. Chene (Oak) Red 10549600. Lalique Crystal. This is retired and its value has gone up since. and "Lalique ® France" is etched on the back side. plenty of stars on a globe in clear crystal (colorless). "Noel 1994" is etched on the side. Type of Glass Crystal. This is retired and its value has gone up since. and "Lalique ® France" is etched on the back side. Lalique Crystal. Cherub On Moon. Ready to adorn your tree this year! Includes Ribbon & Box. Type of Glass Crystal. Color: Clear. Color Clear. 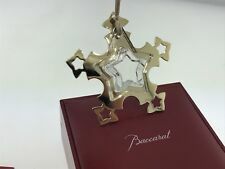 BACCARAT CRYSTAL CHRITMAS Noel Ornament 2012 Candlestick and Star NIB! Gorgeous! LALIQUE DE NOEL. signed Lalique France. It is etched with Noel 2016 Lalique France on the side. This is for the red which is always the more expensive of the two and is produced in more limited quantities. I specialize in collectibles, the unusual and the finer things in life. Baccarat NOEL FIR TREE MILLE NUITS Crystal designed by Mathias mint in box Light up your winter holidays with this Baccarat Christmas Tree. "Lalique ® France" and "NOEL 2001 " are etched on the side. It is in its original Lalique box and never been displayed. Signed Daum. the color may vary slightly as no two Daum. "Lalique ® France" and "NOEL 1999" are etched on the side. It is in its original Lalique box and never been displayed. It is in crescent moon shape with angel and stars. 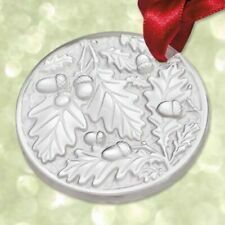 • All have "Lalique ® France" etched on the back side bottom. • Condition: Excellent in box as shown! Even the boxes are in mint condition. • 1994 - Clear - hand-etched "Noel 1994".